This Special Forces Military medical handbook military manual (ST 31-91B) covers any medical situations one could come across. 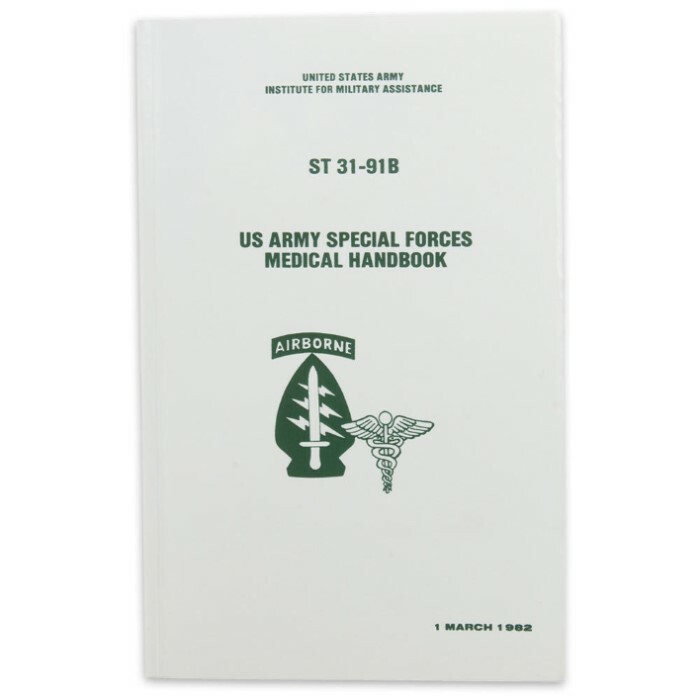 The chapters Include: Body Systems, Communicable Diseases, Clearing Airway Obstructions and CPR, Mental disorders, Nutritional Diseases and Deficiencies, Pediatrics, Gynecology, Obstetrics, Orthopedics, Burns and Blast Injuries, Heat and Cold Injuries, Bites (Snake, Insect and Animal), Overdose and Poisoning, Nuclear, Biological, Chemical (NBC), Shock, Emergency War Surgery, Anesthesia, IV Therapy, Dental Emergencies and Treatment, Preventive Medicine, Veterinary Medicine, Primitive Medicine, and More! 422 pages, 5 1/2 in. x 8 1/2 in. Awesome book, it's very big for 8 dollars (page-wise), and this will definitively come in handy camping or something.